Hoover Restaurant is located not far away from Country View Inn in Sungai Lembing. 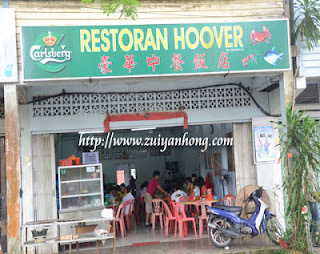 The day when we arrived in Sungai Lembing, we had our dinner at this restaurant. It seems to be a popular dining outlet. In addition to the delicious tomato sauce noodles, the red tilapia fish is also Sungai Lembing famous cuisine. 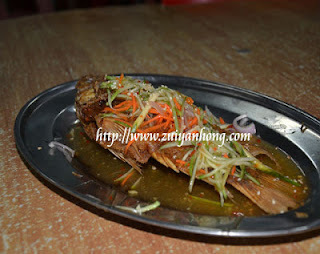 Actually I hardly eat tilapia fish. I decided to try after strongly suggesting by the waitress. Fortunately this plate of sweet sour red tilapia fish had no muddy taste. Or else the culinary skill of the chef was not good enough. We also ordered a plate of shenjiang bean curd. The ingredients were eggs, carrots, lean meat, cuttlefish, Chinese cabbage and Lembing mountain stream bean curd. The Lembing mountain stream bean curd is pretty well known. It's said that the mountain stream is used in the making of The Lembing mountain stream bean curd. For the next post, I will blog on Sungai Lembing Panorama Hill. I just got back from a holiday trip to Sungai Lembing. Your articles on Sungai Lembing are truly informative.